Settlement of the Canalway is marked by a cultural divide that reflects the continental divide. In 1786, Connecticut ceded its land south of Lake Erie and north of the 41st parallel to the United States, and the Connecticut Western Reserve was formed. The Cuyahoga River Watershed area was known as Connecticut’s Western Reserve and is characterized by cultural landscapes and vernacular architecture associated with New England. Immigrants in this area were largely of English or Irish descent. South of Akron the watershed empties into the Ohio River. This area and much of central Ohio was settled by German immigrants from Pennsylvania and the Mid-Atlantic region. In a history of Stark County the author estimates that “perhaps four-fifths” of the population was of German descent. The “Trek of 1817" brought a wave of settlers to Northeast Ohio seeking to escape the increasingly harsh conditions of life in the northeastern states. The War of 1812 left a legacy of destruction in coastal New England, forcing many traders into bankruptcy. Severe frosts during the summer of 1816 followed by an exceptionally bitter winter destroyed many farmers and brought on famine in the area. New England's cultural influence is evident in the area's vernacular architecture and town planning. 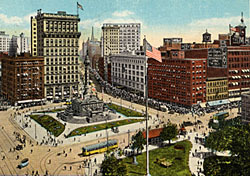 An early New England Green or town common in the area is now the center of the City of Cleveland: Public Square. Smaller towns such as Hudson still have their historic district anchored by the village green. The area has outstanding examples of regional interpretations of vernacular Greek Revival architecture that reflect the New England cultural influence in northeastern Ohio. The Stephen Frazee House in Cuyahoga Valley National Park is a rare exception, being a Federal style building, which is associated with areas in the Mid-Atlantic, not the New England extended cultural hearth in Ohio. The Greek Revival Simon Perkins Mansion in Akron is a high style version of the style, while the regional Upright-and-Wing farmhouses, illustrated by a kitchen wing located in a perpendicular one-story eave oriented section, is in the Boston Mills, Village of Peninsula, and Hudson historic districts. The Irish wave of immigration to the Cuyahoga Valley was a result of canal construction. After the Napoleonic Wars peace settlements of 1815, Irish emigration intensified. Before the potato famine of 1846, more than a million Irish resettled in a foreign country. Many Irish immigrants who landed in New York City were recruited to work on New York State’s Erie Canal, completed in 1825. Upon completion of the Erie Canal, many of these Irish workers came to northeast Ohio to work and made up the bulk of the labor force on the northern segment of the Ohio and Erie Canal. In fact, the 1850 State of Ohio Census lists 22.4% of the state’s immigrants as coming from Ireland. 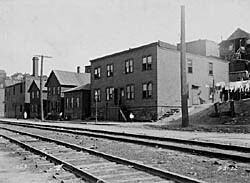 The Irish Town Bend Archeological District in Cleveland’s Flats District reflects the settlement era working class status of this ethnic group. Many of the early German settlers in the southern region of the Canalway were motivated by religion. In 1772 Moravian missionary David Zeisberger led a group of 28 Delaware Indians to the Tuscarawas River Valley to establish Schoenbrunn – the first settlement in the Northwest Territory. This mission settlement grew to include 60 dwellings and more than 300 inhabitants. Today it is a reconstructed village that is managed by the Ohio Historical Society. In 1817-18 an unusual social experiment took root in northern Tuscarawas County when a group of German Separatists seeking religious freedom led by Joseph M. Bimler settled on 5,500 acres. They endured extreme hardship and as a means of protecting the weak and helpless among them adopted a communal lifestyle early on. In addition to farming, the separatists took a contract to build a section of the Ohio and Erie Canal and operated gristmills, a woolen factory and two iron furnaces. The Zoar Village Historic District is a site currently managed by the Ohio Historical Society that contains significant examples of German log architecture, half timber framed buildings and the Zoar Hotel, which displays features of both Greek Revival and German Baroque Revival Styles. Cleveland is the most ethnically diverse area in the Canalway and has several historic districts with strong Eastern European heritage. The Warszawa Historic District or “Little Warsaw” is located in the Slavic Village neighborhood and contains the High Victorian Gothic style St. Stanislaus Catholic Church. The Broadway Avenue Historic District is known for its Czechoslovakian association and contains the Bohemian National Hall. The most ethnically rich neighborhood in the city is the Tremont Historic District. Overlooking the industrial steel valley, Tremont includes 26 churches within one square mile. One of the most notable is the Russian Orthodox St. Theodosius church, with its 13 onion domes. 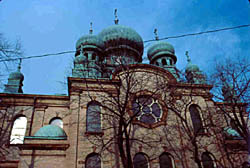 The church was featured in the film “The Deer Hunter.” Ethnic groups represented in Tremont include Poles, Greeks, Syrians, Russian, Ruthenian, Ukrainian, and Lemkovenian. The Polish Workers Hall, the Lemko Social Hall and the densely developed streets lined with vernacular worker cottages intermixed with grand Victorian houses create a rich texture for this revitalizing urban neighborhood known for its restaurants and art galleries.